Fred arrived just over 5 weeks ago and had a rather up and down start to his rehab, with one foot improving and the other, his "problem" foot, lagging behind. As he also had a number of additional musculo-skeletal issues in his back and neck his owner and I were concerned about whether he would make enough progress but finally this week he seems to have decided to concentrate all his efforts on growing better feet. Above is a still shot from his footage when he arrived, with the lower photo the still from earlier today. Perhaps coincidentally, perhaps not, he has also become much more relaxed over the last few days. Lets hope his progress continues more smoothly now, not least for the sake of his owner's and my blood pressure! Shannon will be going home at the weekend. She is one of the oldest horses to come here for rehab but although she is 22 years old she has not allowed this to interfere in any way with her determination to grow new and better hooves. If you look at the upper photo, from her arrival, the under-run heel and long toe are clear. What is most obvious now in the lower photo, I think, is the new hoof growth visible in the top third of her hoof; this is bringing her toe and heel back and allowing the hoof to be stronger and more supportive. Her frogs were quite severely contracted and it will be some months yet before they finish strengthening, I suspect, but she has already done a good job of building a much healthier palmar hoof. As ever the caudal shots tell the most interesting story. 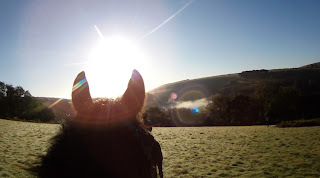 Shannon, like most horses, was landing intermittently toe first/flat when she arrived; her weak frog and digital cushion were signs of long term problems with the palmar hoof and she had been diagnosed with navicular bone damage as well. Twelve weeks later she has a clear heel first landing and although by no means out of the woods has made good progress, particularly in view of her age. As with the other front foot you can clearly see the new hoof growth about a third of the way down her hoof. Once its fully grown in she should have better sole depth as well as a more supportive foot. Although the left front was her lamer foot, Shannon had a nasty central sulcus infection in this right front which you can see on the caudal shots below as well. I've found that Veterinus derma-gel is the best off-the-shelf topical gel for dealing with these sorts of splits and Shannon's frog has certainly improved and is no longer painful. Its the sort of niggling problem which is worth keeping on top of until it has completely healed up. This is a much better frog and digital cushion now but as you can see the split is stubborn and it will take a while yet before it has grown out. However now that she has a solid heel first landing the foot is getting the stimulus it needs to develop and maintain itself. I've seen a lot of older horses do well through rehab over the years but Shannon, I must admit, has really surprised me. Of course not every horse is going to be able to reform their feet as rapidly and effectively as she has done but she is a credit to her owner's dedication and a reminder that, no matter what the age, healing and recovery are possible. Freddie will have been here 2 weeks this weekend so after all the excitement of getting the haylage done earlier in the week I thought it was time for a nice ordinary hoof update. As usual, the upper photo shows his foot on arrival and the lower, comparison photo is the most recent. Of course its very early days for Freddie and he is not yet landing heel first but there are signs that he is beginning to improve the back of his foot. His frogs are a little more robust and to my eye his heels look a little less under-run. The back of his foot seems less contracted at this angle which is encouraging. Freddie's feet are growing at a reasonably good rate, as you can see from this angle, so there should be more dramatic changes to report on over the next few weeks. The balance of his feet is also changing and again this should be clearer when we compare his 4 week photos.